Climate Change or Climate Variability: which matters more for crop production in the PNW? Several modeling studies have been conducted in recent years to estimate the potential impact of climate change on future crop production. These studies generally indicate that the magnitude of the potential near-future impact (through 2050) is relatively modest for most crops in the Pacific Northwest – and usually somewhat positive. Climate variability, on the other hand, already impacts crop yields at magnitudes equal to or greater than those projected for mid-century, and often in a very negative way. So why do these studies focus on future climate if current climate seems to be the bigger concern? Before answering that question, let’s back up and clarify what the research shows and what producers are experiencing. One recent study completed by a team of WSU scientists (of which I was one), Stöckle et al. 2010, projected changes in average yields for wheat, potatoes and apples in the Pacific Northwest to be relatively modest (+ or – <10%) through mid-century and only becoming more dramatic (+ or – >10%) by late century, assuming sufficient irrigation water supply and basic adaptation strategies. 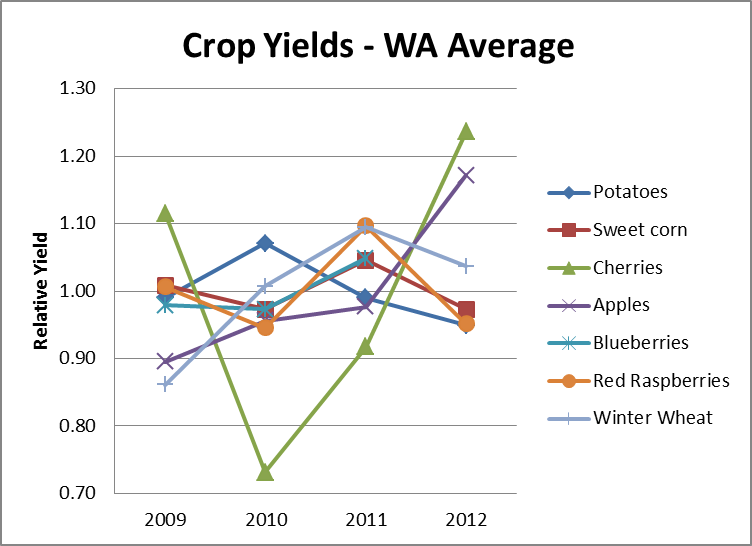 In contrast, looking at actual reported yield data for 7 crops from 2009-2012 (Figure 1, data from USDA NASS surveys), it is obvious that producers already experience yield variability of that magnitude in most crops, and much greater in extremely climate-sensitive crops like cherries. This is the climate variability farmers experience from year to year that can translate to a “good year” or a “bad year” for yields of a given crop. So back to the question… what gives? If climate variability is a big concern now and future climate projections represent modest changes for the PNW, why is future climate change getting all the attention? The short answer is: we already know climate variability is a major concern for farmers now, but until recently we had no idea what to expect for future crop production. Recently published future yield forecasts (e.g. Stöckle et al. 2010) are usually presented on the basis of an average yield expectation for the future time period, without presenting the expected distribution of possible yields (variability), simply because scientists have been trying to triage whether we need to be concerned about the trend or not. These studies appear to indicate that future yield trends are much less of a concern in the PNW than they are in many other parts of the world. That’s good for PNW farmers. However, climate variability is embedded in these future forecasts (the forecasts simulate yields for future climate conditions assuming we will experience historic patterns of variability), but in most of these publications expected variability simply isn’t presented. Just because the study estimates a yield trend of < + or – 10% doesn’t mean that we won’t still see yield distributions several times that magnitude in any given year (as we already do). Furthermore, the question that is only beginning to be investigated is whether climate variability might be amplified under future climate. For a rain-fed crop, such as wheat in Eastern Washington, yield is largely a function of the amount and timing of precipitation. Since precipitation is highly variable, so is historic and current wheat yield. If the variability of precipitation increases in the future through more extreme events like the 2013 summer-time thunderstorms across Eastern Washington (which some studies are beginning to explore), the variability of yields might also increase (that’s bad for farmers as it makes management decisions much more uncertain). While the magnitude of the change in yield expectation due to climate change may be modest, we still don’t know whether there might be an additive effect when considered together with future climate variability. Yield projection studies in the coming years will surely present yield distributions as well as averages – because as we already know it’s the bad year that matters much more to the farmer than the average year. For now, all indications are that the climate variability signal is likely the more important signal for most PNW farmers for the near and intermediate future (through 2050). Farmers can handle small changes in trends, but bad years can put a farmer out of business in a hurry. Even in future scenarios we still expect that we will need to deal with the significant variability that we already experience, we just don’t yet know if that’s the good forecast or the bad forecast. 2 thoughts on "Climate Change or Climate Variability: which matters more for crop production in the PNW?" David, a few responses…. There are many climate and weather considerations that affect inter-annual yield variability. Some of these are clearly climate patterns (ENSO), such as precipitation effects on dryland grain production. Others are more “weather” effects, such as frosts, freezes, heat stress, etc. that are currently less predictable on the basis of inter-annual climate patterns. My purpose was not so much to attribute any specific yield variability to either issue, but to just show that there yield variability is significant, and that climate is one key reason why. There are also many variables and artifacts that are captured in NASS survey data – and there are just as many questions about the accuracy and preciseness of NASS data and attribution to a specific cause is generally impossible. So, NASS survey data should never be used for making very precise predictions. The same can also be said of modeled forecast projections. Unlike in an experimental study where statistical significance can be calculated from the collected data, NASS data and model forecasts should be used more for determining the sign of a trend (+ or -) and relative magnitude of change (e.g. < 10% or >10%). The key message I was conveying is that for most of our crops, the current relative yield variability is at least as significant as the projected forecasts for yield changes due to climate in the intermediate future (in the range of ~10% +/-). Again, though, these need to be read as estimates of relative magnitude, not hard-and-fast predictions of what may happen. None of us are really concerned about a small yield increase or decrease (+/- ~10%) over the next few decades (we can likely adapt to that), but we are all worried about a serious “down year” or the possibility that the there might be more frequent or severe “down years” in the future. Unfortunately, there is very limited research currently available projecting whether climate change may amplify inter-annual climate variability patterns or extreme weather events. That’s where a lot of attention is now moving.